Have you ever seen a t-shirt that was calling out to you? Well this one here was calling my name for my Coffee Reviews & Giveaways! "Caffeine isn’t a drug, it’s a vitamin! This lovely molecule is the main catalyst of capitalism. Coffee is liquid motivation, but consume too much and you’ll end up road-raging someone off the road while screaming on your cell-phone. Caffeine, it’s the substance of legend and the driver of the economy. 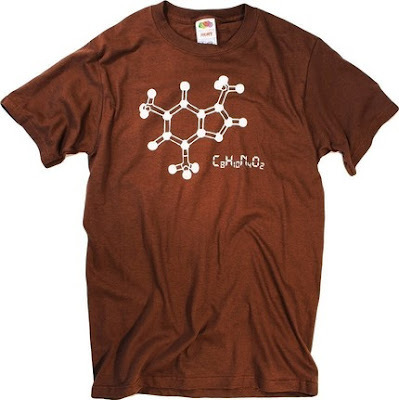 Show your love and respect for this lovely molecule by wearing this wonderfully designed and printed t-shirt." They have a 12-COLOR Screen Press and use water-based super-soft ink on their new designs. Basic one color t-shirt designs will still be printed with usual soy-based plastisol ink. This will allow them to print HUGE images and nearly unlimited colors! 1) MAIN ENTRY: You must go visit ISOTOPE at their Etsy store and come back and tell me who you would buy a shirt for and which one!!!!!! 3) Read my review on Dolce Gusto and leave a comment there and come back here and claim your (10 entries!!!) by writing "I read the Dolce Gusto review"
THANKS FOR ENTERING AND HAVING FUN! Open to US residents only. Please include your email addy at least once so I can inform you if you win. Winner will have 48 hours to claim prize! I like the Darwin Finch T in dark purple. lol I'd buy it for MYSELF or my friend Joey, but would get it for him in green. I love the Tree of Life Species Phylum Vintage Science Diagram Illustration Graphic T-shirt for myself! Thanks! I would buy this coffee one for my husband! I enjoy coffee, but he is a lover of various coffees! I read the Gusto Review! I favored Isotope on Etsy! I like the Tree of Life Species Phylum Vintage Science Diagram Illustration Graphic T-shirt LADIES - S,M,L,XL,XXL available. 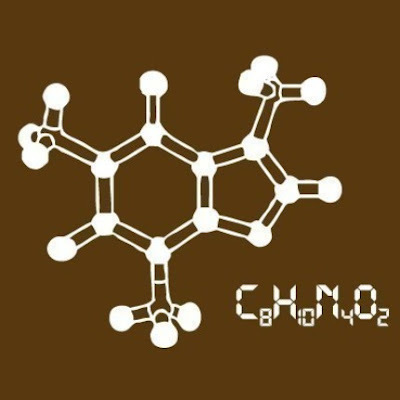 I would buy the caffeine molecule tee shirt (sz XL) for me-me-me! I would buy the Geometric Space Time Continuum Math T-shirt for my boyfriend. I read the Dolce Gusto review! I just hearted Isotope on Etsy! "win 3 bars of soap from Heavenly Soaps"
I know my husband would love this caffeine shirt. MAtt would totally love the nuclear power plant chirt...he's geeky that way! Entering Anna from facebook who said "Haha that's awesome! =] I love those kinds of shirts :D If only I had one... ;)"
#2 Entering Anna from facebook who said "Haha that's awesome! =] I love those kinds of shirts :D If only I had one... ;)"
#3 Entering Anna from facebook who said "Haha that's awesome! =] I love those kinds of shirts :D If only I had one... ;)"
#4 Entering Anna from facebook who said "Haha that's awesome! =] I love those kinds of shirts :D If only I had one... ;)"
#5 Entering Anna from facebook who said "Haha that's awesome! =] I love those kinds of shirts :D If only I had one... ;)"
Going to pick the winner!! G'luck mates! Entry #65 Cheryl Hubenthal was picked by RANDOM.ORG! Thanks so much for all who played! I wish I had a free shirt for all of you! Don't forget to go to ISOTOPE on ETSY and support them! Their shirts rock and are high quality! I had to redraw since the first winner never responded! New pick is DakotaPam! Email me your addy! You have 48 hours.